If you’ve ever wanted to delve more deeply into the mysteries of human emotion, perception, and cognition, and of why we do what we do, these 48 lectures offer a superb place to start. With them, you’ll see the entire history of psychology unfold. In the hands of Professor Robinson, these lectures encompass ideas, speculations, and point-blank moral questions that might just dismantle and rebuild everything you once thought you knew about psychology. In fact, you’ll not only learn what psychology is, but even if it is, as Professor Robinson discusses the constantly shifting debate over the nature of psychology itself. Lecture by lecture, Professor Robinson navigates from one subject to the next, and you’ll follow along as he recreates a Platonic dialogue; explains brain physiology; or explores the intricacies of middle ear construction, the psychological underpinnings of the Salem witch trials, and the history of the insanity defense. If high heritability determines how much the environment influences the value of a trait, and more. How did Psychology come to be what it is now? What made the experience of listening to The Great Ideas of Psychology the most enjoyable? This was so thought provoking. It was very similar to an undergraduate course I took years ago, but at the time I didn't really appreciate it as much as I do now. I love gaining the perspective of how ideas and fields came to be, and what influences the different approaches to psychology in study and practice. The teaser review that comes up for this course is just plain misguided. As a former Ivy league professor I applaud Professor Robinson's approach to the topic. He puts modern and historic psychology and its underlying theories in the perspective necessary to understand the rational basis from which they were derived. I am a scientist and I felt this his approach and coverage of a diverse set of related topics was excellent. I should also point out that my wife who is a mental health professional also found this book to be not only a great read, but an excellent coverage of the topic. I teach these concepts to graduate students and still learned a lot. I also wrote Dr Robinson to thank him--and he wrote back. I cannot recommend this course enough to the serious student of humanity. Really informative and interesting. 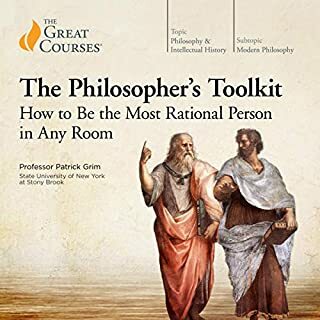 Overall it leans heavily into pholosophy and the history of thought with quite a few hours dedicated to (fawning over) aristotle. So quite different to any psych course focusing more on modern experimental theories, though they are in there too. Maybe not for everyone but I gave it full marks as it is a great listen, the speaker is engaging and I learned a lot. Oh my god, just say it. Now, I'm in love with psychology and enjoyed the first book in the great courses series, but I can't get through this droning. It's not to say the content isn't interesting, but the presenter is constantly moving backwards and forwards without actually saying anything for minutes on end. In an attempt to move to a new point in chapter 6 he introduces the topic, why it might be important, people who influenced it (but not why), what things are called in other languages, pointless opinions on the youth in the audience, "what I'm going to demonstrate is", "you don't really need to know x about it at your level"... well thanks, I've entirely forgot what you were at least going to talk about because you've said nothing about it for what seems an eternity. I am now analyzing him and his love of his own voice and pretentiousness and lost all interest in the supposed topic all together. 6 chapters in and I feel nothing at all has been said and I just have been sitting here waiting for the lecture to start. if you want to take notes on a lack of direction and focus on lectures, this is for you. If you're looking for a laundry list of things to independently look up, also for you. If you're actually looking for insightful conteent, look elsewhere. This course explores the development of the field of psychology, going through all the major developments, ideas, and problems it has faced. Your mileage may vary based on how seriously you take psychology as a legitimate field of study. While I have some doubts about some concepts, overall this is an interesting ride on the human understanding of mind, personality, and to a certain degree criminal law. Interesting subject, well read. The author not only commands the topics but has an extraordinary vocabulary, making it a great listen. Wonderful broad view of psychology with a sprinkling of philosophy. I recommend it for all students of psychology. 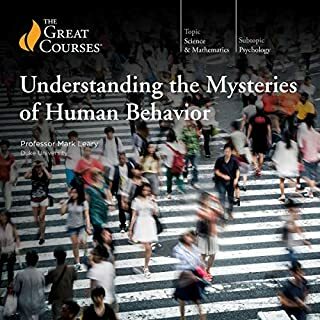 An excellent and well thought out course of lectures that summarize many of human psychology's insights. Fantastic narrator, needs a bit of updating, and I would have liked to have heard a bit about transactional analysis by Eric Berne. Enjoyed the full production very much. I'm taking an Intro to Psychology class. The Great Ideas of Psychology is the perfect supplement. I've re-listened to several chapters whilst studying relevant information in class. This audiobook is very enjoyable. 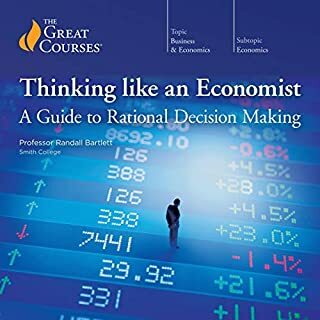 No prior knowledge of psychology is needed, however this is not an audiobook that can be listened to passively. Many of the concepts presented require your full attention. I've often had to pause the audiobook and take a moment to process the information Id just heard. I've enjoyed this book very much and would recommend it highly to sony one with a serious interest in Psychology. A well-structured course of lectures, with each lecture summarised at the start and recapped at the end. Not quite the flair of Prof. Martin's Psychology lectures,-- sometimes he gives the impression of having given the lectures on one too many occasions. Nonetheless, highly recommended. 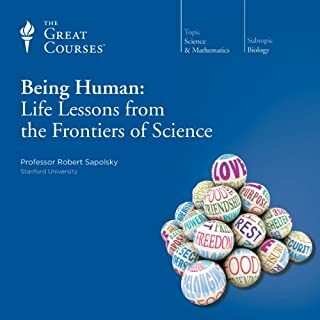 I've no background in psychology but I've now listened to two courses of Psychology lectures -- as well as the audiobook of Ruby Wax's Sane New World. The lecturer's engaging, the irrelevant, cringeworthy and insulting references to autism less so. It was jarring to be listening to a lecture and then have, well, basically my very existence lamented. This had happened a couple of times with these psychology lectures. It's like there is some sort of death drive for the lecturers to refer, by the way, to The Tragedy of Autism. It's really unhelpful for them to be perpetuating that view. Autistic people (who are very various across the "spectrum") can face challenges, sure, but bring referred to as tragic is (for the many of us who reject that rhetoric) one of them. It feels awkward to pay money to be insulted and discriminated against. On the upside, the lecturer is really charismatic. Where does The Great Ideas of Psychology rank among all the audiobooks you’ve listened to so far? One of the best audiobooks I have listened to, and kept me engaged for all of the 23 hours. What does Professor Daniel N. Robinson bring to the story that you wouldn’t experience if you had only read the book? Impossible: it's 23 hours long. 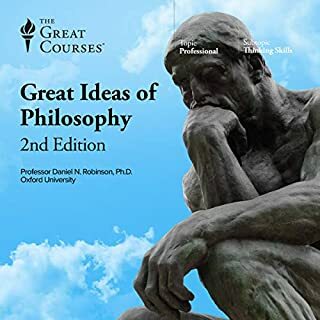 Would you try another book written by The Great Courses or narrated by Professor Daniel N. Robinson? Professor Robinson's voice takes some getting used to. Yes, I'll be more selective about the subject matter. 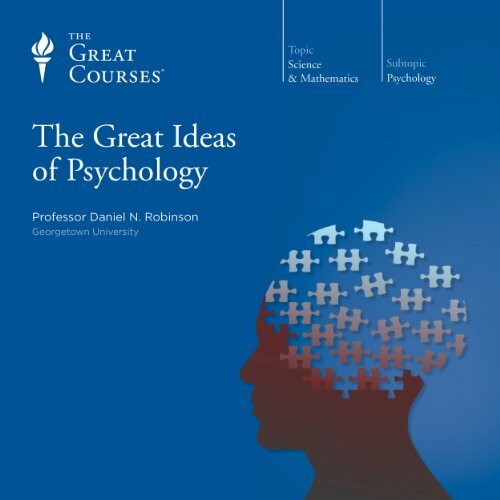 Would you consider the audio edition of The Great Ideas of Psychology to be better than the print version? This course was structured as 30-35 minutes lectures, which each of them covers an individual topic. Perfect for my daily commute. The lecturer,who is very articulate and has a good sense of humour. The course covers a wide range of topics in Psychology. Since this is a relatively young discipline, the lecture also attempts to provide a historic view. In addition, prof. Robinson is enthusiastic about the subject, which make it interesting and easy to follow. loved it, comprehensive overview. I learned so much from witch craft to mental illness, homosexuality , fundamental attribution error etc , amazing stuff . it's also beautifully narrated, bravo. 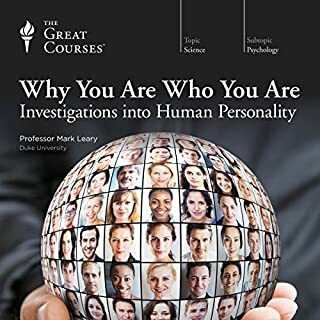 This is the second Great Courses psychology related course I have tried to listen to. First time I thought it was because the course was an intro to the subject. I had higher hopes for this one. I found the course content really dull and boring, giving no real info. Verbose and academic. I am interested in psychology for a variety of personal and professional reasons. There are far better resources for psychology. I have like Great Courses material previously but having to bad experiences in a row I am reconsidering my preference for them. Thoroughly enjoyed this course; Professor Robinson is my favourite teacher and lecturer. He surveys the full breadth of the psychological landscape with marked sagacity. The only thing to note is that these lectures are quite philosophically orientated; focusing a fair bit on the philosophical realities and implications of the various approaches to psychology. Great overview on a wide range of related topics. Lack of depth of analysis though, with various flawed arguments being presented without pointing out the flaws. This is an EXHAUSTIVE review of psychology that I doubt could EVER be improved! Professor Robinson starts from physical stimulus to perception to interpretation to social interactions and culture. Psychology on so many levels, with humour and an abundance of personal experiences that describe the history of attempting to explain and correct abnormal behaviour with all the approaches possible. VERY HIGHLY RECOMMENDED. It’s not monotone and I personally could listen to him speak each day. Thank you for creating this audio book it was awesome. I expected a coherent overview of psychology, but the very detailed lectures did not form a whole. The series give the impression of a compilation of unrelated, separately prepared lectures.That also created some repetition of studies or anecdotes mentioned. He concentrated on a few great thinkers such as Aristotle, David Hume and Freud, but did not mention some of the other big names. I found that he tended to revert back to philosophy, where his strength lies. I personally would have liked more emphisis on recent developments in psychology in this series. Overall an exhaustive, detailed encounter of some great ideas in psychology, worth the effort to finish, but do not expect to find any answers. The lecturer has a great mind, is very knowledgible on his subject, and lectures very well. I struggled to follow the narrator in his Aristotelian theory of psychology.